I love the beach, and so do my kids. It's exciting to get packed up, and even more awesome when we reach our destination. There are three things I don't like though...one is at the beginning of the trip, the other two are at the end of it. Below I will list the three solutions to my challenges, and then let you know exactly what those challenges were (before One Step Ahead came in to the rescue!). You put your coins in the meter, slather up the kids with their sunscreen, make sure they have their shades, sand toys, blow up raft, and towels. You start walking on the sand to get to the beach and it's only a matter of seconds before you're hearing (and feeling), 'ouch, ohhh, hot, hot, hot, ouch!' The sand is too hot to walk on, even in flip flops! That's where the awesome little Sun Smarties Water and Sand Socks come in handy. Not only are they light-weight and breathable, but they also have an UPF of 50+. My favorite thing about them though is they allow you to walk freely across the sand, no matter how hot it might be!! Perfect for my little grandbaby, and perfect for the fam. too, 'cuz one of us always ends up carrying her along with all of the other things we're toting, so she doesn't burn her little tootsies. Or I should say we used to... now she can happily run along beside us in the sand. THEN, when it's time for her to play, she can wear them right into the water and not have to worry about the sometimes yukky ocean bottom. 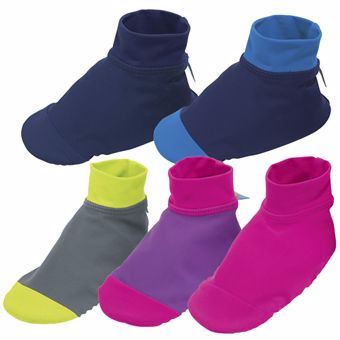 Prevent slips and sunburn with our kid's UV sand and water socks! They protect against hot sand, burning sun, and slick, yucky ocean and lake bottoms. The swim socks' non-skid soles and toe caps offer superior traction to walkers and crawlers, while the UPF 50+ fabric shields the top of the feet, a magnet for sunburn. Soft and feather-light. Not designed for concrete. Machine wash. Imported. Designed by OneStepAhead! Choose from 5 different colors. So, when One Step Ahead designed this Collapse-A-Pail I was delighted to find it. Buckets are the best for the beach, but they're they worst for taking up room in the trunk after play time is over. They're big, bulky and you really don't want to put them back in the bag until you get them home and clean. With this pail, I fold it up (simply push it together) and can stow it in any area of the trunk quickly. No muss, no fuss. I like it. And of course the collapsible feature makes it easy to store at home too. Win-win. The last challenge I have at the beach is wet clothes. I don't want to pack up wet swimsuits and risk getting the other items around them soaking wet (or even damp for that matter). I certainly don't want to risk mold (which always seems to happen if I throw something wet on top of clothes in the beach bag). Now it's no longer a challenge. With the Take-Along Wet Bags 2-Pack from One Step Ahead I can toss wet items in the bag, zip them up, and we can be merrily on our way. The bags are see-through so you don't forget about what's in them, and at 12" x 10", they're nice and roomy too. Here you see my son's rashguard sun protection shirt and swimming trunks in separate bags. The one on the left is zipped, the one on the right is not zipped quite yet. I could put both pieces in one bag, I just put them in two to show you the picture. The bags have a ring on them too, so you can hang them on strollers, diaper bags, beach bags, etc. Another simple but thoughtful feature that makes this bag duo a must-take on beach trips. Of course there a gazillion other uses you could find for these handy bags too. That's definitely part of their allure. Always be ready for life's messy little surprises! Transparent, so you can see what's inside. No matter how you use them, our reusable Wet Bags keep wet and dry items apart. A must for beach bags, diaper bags, travel, daycare, camp…even keep one in your car. Keep wet swimsuits and dirty clothing contained, cell phones and wallets dry, and sunscreens and toiletries confined! Reusable and water-resistant, with a rugged zippered closure.12"W x 10"H. Designed by OneStepAhead! I always say One Step Ahead is a favorite place of mine to shop. With solutions like these, it's easy to see why that is true. You can learn more about these products and more, by visiting the One Step Ahead website. You can also follow them on Facebook and/or Twitter. You're all ready for the beach. Cool items. Those sand/water socks would be great for my grandsons to wear and protect their feet! Never even knew there were such socks, they would be good for the beach indeed. These look fun to have! My kids are getting too big for a lot of their stuff. :( I'll most certainly tell my sister about them. I love all of this. I wish I had these things the last time I was on the beach. Would have saved a lot of cleanup. It's always nice to have helpful tools for all the after fun conditions at the beach. Those water socks are awesome. Sometimes there is a lot of seaweed and my 2 hate walking through it barefoot. Awesome items! All useful too! Great products and super handy at the beach or pool! I think you must be all ready! It would be nice to prevent the sand from getting everywhere. We have these for my daughter and I Love them. I'll never forget when I once cut the bottom of my foot open on the bottom of the ocean. One Step Ahead has some great products. You reminded me we need pool shoes! We were just at the beach last weekend and that hot sand was brutal! I need those footies in my size! One Step Ahead makes some great products and the ones we've had have been great. We haven't been to the beach in years unfortunately and don't know when we will. Those sand and water socks are awesome! Do they make them for adults? lol My kids could use those when we go to the beach because that sand can get so hot! These are all great items to have with little ones! My kids are out of the baby phase now but we still have to pack and prepare a ton for a trip to the beach. This makes me want to go to the beach! It's nice to see lots of items that will make your vacation easier when you have toddlers or kids. This will help a lot of parents! The collapsable pail is genius! Those water socks are awesome too as shoes can be too heavy at times! Love the wet clothes bag, that is the biggest issue we have with going to the beach is trying to figure out how to take the wet and sandy stuff home. Ugh! All over me, the van and everything else. Oh this is a GREAT idea for beach days-- and perfect for little ones that don't understand the need for this protection! That collapse a pail is such a cool little contraption! Perfect for summer vacays!